Combining the ‘point-source’ benefits of coaxial designs with the consistent coverage of Differential Dispersion technology, CDD-LIVE! full-range systems project sound evenly front-to-back while exhibiting wide horizontal coverage close to the speaker — delivering ultimate fidelity and impact to all corners of the audience. Onboard Class D amplification, DSP and Dante™ Digital Audio networking assure simplicity of stage set-up and efficient installation, while tour-grade enclosures and comprehensive mounting options — including pole mount, wall brackets, yokes and rigging inserts — provide maximum flexibility in deployment. With sonic consistency across the range, a rectangular coverage footprint and a multitude of deployment options, CDD-LIVE! is truly versatile — the professional self-powered solution that means business. It combines the ‘point-source’ benefits of coaxial designs with the consistent coverage of Differential Dispersion technology. All CDD-LIVE! full-range models feature Martin Audio’s unique, patented Coaxial Differential Dispersion™ technology to deliver perfect sound to every member of the audience. In contrast, coaxial systems can achieve ‘point-source’ summation of the LF and HF sections at all positions off-axis, even close-up. This is one reason that coaxial devices are often used for near-field applications such as studio monitoring. Significantly, until now one disadvantage of conventional coaxial devices has been high frequency beaming, where the high frequency dispersion reduces as the frequency increases. This is primarily because conventional coaxial devices channel high frequencies through a narrow tube in the pole-piece of the magnet system. CDD-LIVE! coaxial devices overcome this by incorporating an innovative static waveguide that merges seamlessly with the unique cone shape — maintaining the dispersion pattern out to very high frequencies. With a conventional X° x Y° horn, the speaker is usually placed just above head height and aimed towards the centre of the audience. This produces an imperfect coverage pattern which misses out some areas — particularly side areas close to the loudspeaker. In contrast, a CDD-LIVE! Coaxial Differential Dispersion system produces a rectangular coverage pattern to reach all corners of the audience, and wide horizontal coverage is achieved very close to the loudspeaker. Walking the room, the consistency in frequency response and SPL — both close to the loudspeaker and further back — is exceptional. The improved coverage close-up also means that CDD-LIVE! speakers can be spaced further apart in some installations, reducing overall speaker count, and similarly a reduction in frontfill/infill speakers in a live sound environment. Each CDD-LIVE! system incorporates a powerful electronics module with on-board DSP, Class D amplification and Dante™ digital audio networking — simplifying set-up, enhancing control and eliminating amplifier racks. Lightweight, switched-mode power supplies auto-range to global mains voltages from 100 to 240V 50/60Hz, while Power Factor Correction smoothes out the mains current draw over the whole of the AC waveform. DSP functions — including parametric EQ, delay, muting, gain and preset selection — can be controlled over Ethernet from a PC or Windows tablet via intuitive VU-NET™ proprietary software. For simple set-ups using CDD-LIVE! full-range systems, three ‘plug-and-play’ factory presets for full-range, stage monitor and operation with subs — as well as a user-defined preset — can be selected on the rear panel, instead of using computer control. Four LEDs indicate which preset is selected and can also be switched to operate as a signal level meter. 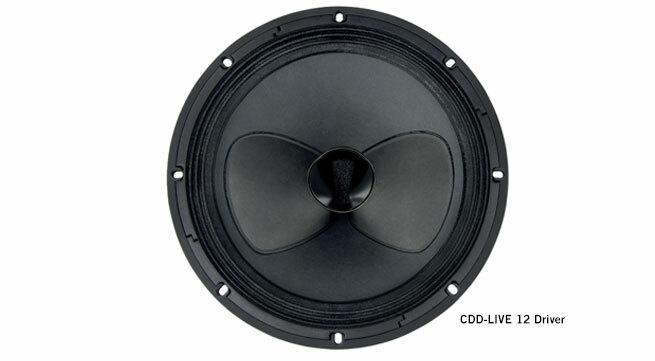 Each subwoofer has presets for operation with either the CDD-LIVE 8, 12 or 15, plus a user-defined preset. Additional presets provide the appropriate settings for the rear-facing subwoofer in a cardioid pair. An optional rain cowl is available for outdoor use. Each CDD-LIVE! system is Dante enabled. Delivering significant improvements in Audio over IP technology in terms of speed, high channel count and with near-zero latency, Dante networking opens up tremendous opportunities for digital audio distribution and control — from a front-of-house live music system to a large-scale installation with multiple locations and zones. With audio transmitted digitally over a single CAT5 cable, quality is maintained however long the cable run and integration with other devices in the sound system is straightforward.Setting up a Dante network is simple — even complex networks can be configured easily and quickly, with all devices discovered and displayed in the Dante Controller software. Once set-up, the computer running Dante Controller can be removed from the network if desired, with system settings stored in the devices themselves and automatically restored when a device is power-cycled.